This morning, DC fans across the world were shocked by the news that actor Henry Cavill would reportedly not return as Superman in the DC Extended Universe, marking last year's Justice League as his final appearance as the iconic superhero. While there is no definite confirmation of this news yet, many DC fans fear the worst. Now, a new report claims that Warner Bros. already has their eyes on a new actor to don the bright red cape: Black Panther actor Michael B. Jordan. This report comes from Deadline, who claims that Warner Bros. is currently set on making a Supergirl movie as the immediate replacement for Superman after Losing Henry Cavill as the man of steel. But they are considering casting Michael B. Jordan some time after that. Immediately recasting Henry Cavill as Superman would be risky, as it could further divide a good portion of their fans, so it's understandable why Warner Bros. are taking the Supergirl route instead. Warner Bros. is well aware of how many people are currently displeased with the state of their DC franchise, and are apparently trying to find different angles to change that. These angles apparently include introducing the female version of Superman into the franchise, and possibly even changing the race of Superman himself. While this change to Superman will undoubtedly be controversial, as every iteration of Superman in the past has been white, it will surely give DC and Warner Bros. the chance to take a new angle on Superman that audiences have not seen before, which, if handled correctly, can lead to some fantastic storytelling. 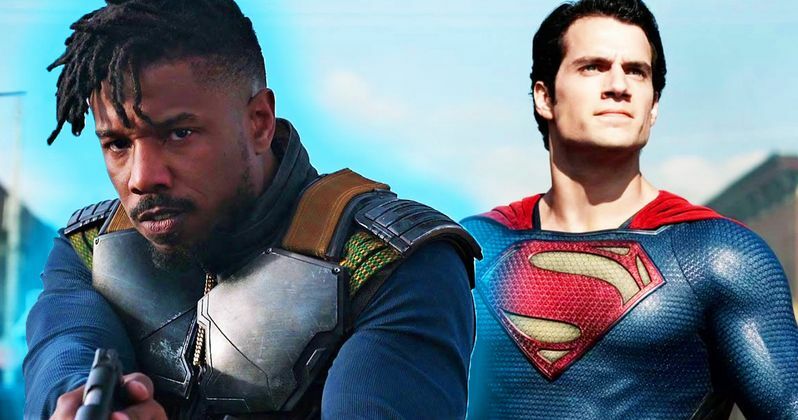 If Michael B. Jordan were to be cast as Superman, it would be several years still before we saw him take on the role in what would essentially be Man of Steel 2. With all of Warner Bros.'s DC movies currently lined up, a Superman movie is still several years away, with the Supergirl movie being slated first. Similar to the show Supergirl, Warner Bros. will likely want to establish Supergirl as her own entity in the DCEU before actually pairing her up with Superman. Looking past the racial controversy that could arise, Michael B. Jordan would hypothetically be a great choice to play Superman in the DCEU. He is certainly no stranger to superhero movies, having playing the Human Torch in 2015's Fantastic Four and the villain Killmonger in Black Panther earlier this year. He was truly phenomenal in both roles, even as the Human Torch. Despite Fantastic Four not having a great script and feeling utterly jumbled, Jordan gave the role his all and gave a fiery performance, becoming one of the best parts of the movie. While it's unclear if Henry Cavill is indeed stepping down from the role of Superman or not, it would surely be interesting to see Michael B. Jordan take on the role at some point down the road, in addition to seeing the DCEU put an emphasis on Supergirl. This report from Deadline may be controversial news, but a few years down the road, Michael B. Jordan may prove himself to be the greatest Superman to ever grace the screen.